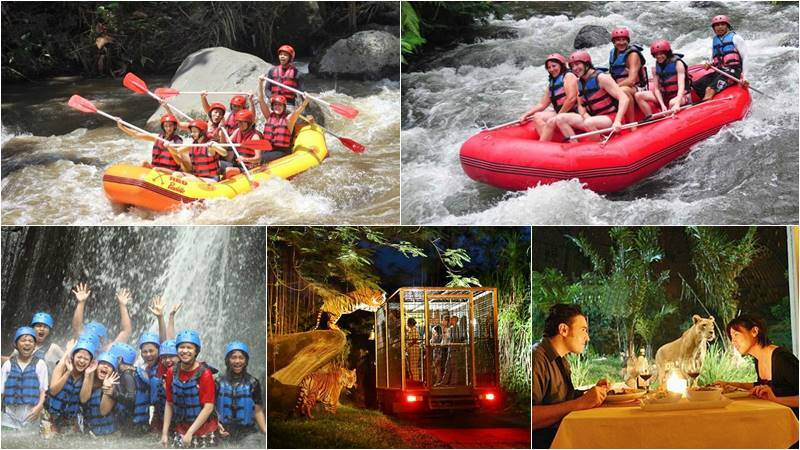 Bali Rafting + Night Safari tour is an awesome Bali Rafting combination tour package, where you will take part in Bali whitewater rafting at Ayung river with lots of fun (afternoon) adventure, then combine with a Bali Safari and Marine Park visit to enjoy Night Safari Program. This package provides you with the most unforgettable rafting in Bali. Let’s join us and get Bali rafting adventure special price. 12.30 – Start Rafting Adventure with 2 hours journey. 14.30 – Finish Rafting, Going up to restaurant for shower and changes. 15.00 – Having Indonesian Buffet Lunch. 21.00- Transfer back to Hotel. 18.00 – Welcome drink and walking safari. 18.30 – Night Safari Journey. Join our professional team of Ayung River Rafting for fantastic afternoon Bali rafting experiences, enjoy a unique and unforgettable tour through winding gorges, lush jungle and magnificent terraced rice fields. With few speeds of water, the volume of water is stable all year round, allowing you to have great fun. From the starting point, all participants will be equipped with life jackets and helmets for the safety. Our experienced guides will guide you for about 2 hours through your exciting Ayung rafting adventure. Follow his instructions and paddle along the way, laughing, shouting, and an amazing adventure. This is the best way to feel the Ayung River’s wonder. Bali Safari & Marine Park, home for over 60 different animal species, continues to develop its visitor – friendly facility. Night Safari is now a signature of the park after 2 years of successful operation along with the Safari Journey, Elephant Safari, Bali Agung Show, Tsavo Lion Restaurant, Mara River Safari Lodge, Waterpark and Funzone . Additional uplifting programs were introduced to improve the existing Night Safari package and make this fun trip more memorable. From the Walking Safari, go through the African Savannah with Night Safari, get up close and personal with animals at the animal encounter, watch fired dancing, drumming, and puppet show named Afrika! Fire Show rhythm to enjoy a barbeque dinner in the Nkuchiro Bar. Starting from Toraja Terminal, Safari Rangers will bring the guests to take a walk around the park. Komodo island is the first destination where you enter the cave of Komodo to see bats and Brazilian turtles. Out of the cave, you’ll see the Komodo dragons roaming under you through the bridge in the middle of the porcupine nest. The Walking Safari continues to the Ganesha court, and you are greeted by the 19 meter statue of the wisdom, prudence and salvation of Ganesha, which is part of Balinese mythology. You’re going to enter the Bali Theater, home to the day’s spectacular Bali Agung Show, and out in the APEC alley to meet the iguana, binturong, owls and lemur. You can also watch the white tiger walking opposite you in Ranthambore. You’ll arrive in the Mara River Safari Lodge lobby after 20 minutes walking to start your journey inside the cage. A specially designed tram with up to 12 guests takes you on a thrilling journey through African savannah to get close to wild animals and learn fascinating facts from our expert team. From hand-fed zebras, elephants and giraffe to watching the hunt of mighty lions and fierce tigers. Satisfied with the Night Safari, in the Mara River Safari Lodge lobby you will have the opportunity to play and take pictures with exotic animals. At the animal’s encounter you will be awaited by Snake, macaw birds or binturong. By watching our new night show, your night will become more exciting! Afrika! Rhythm of Fire Show. This show will perform fire dance, drumming and puppet show on the open stage in the front yard of the Mara River Safari Lodge. The show begins at 7.30 pm and is playing for about 15 minutes. To enjoy a special night, relax and enjoy the all you can eat BBQ dinner and watch the African Panorama from N’kuchiro Bar & Grill. Your night will become more memorable by watching our new night show, Afrika! Rhythm of Fire Show. This show performs fire dance, drumming, and puppet show on the open stage at Mara River Safari Lodge’s front yard. The show starts on 7.30 pm and is about 15 minutes play. To wrap the special night, take a breath, relax, and enjoy the all you can eat BBQ dinner and watch the African Panorama view from N’kuchiro Bar & Grill. Ticket for the rafting with 3 options : Ayung River, Telaga Waja river or Melangit River.